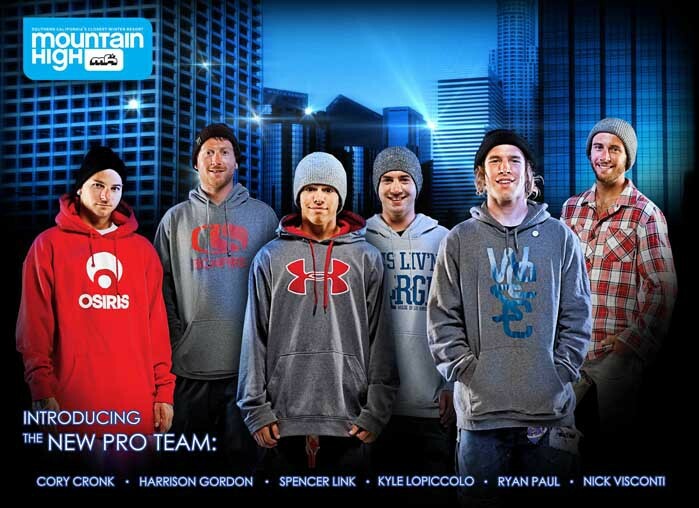 Wrightwood, CA – August 15, 2011: Mountain High is proud to introduce its professional snowboard team for 2011/12: Cory Cronk, Harrison Gordon, Spencer Link, Kyle Lopiccolo, Ryan Paul and Nick Visconti. Says Cory Cronk, "I'm really pumped on this new group. Having a team here, riding together throughout the season is going to make for some really good times at the High." Cronk has been with Mountain High for several years and is the only returning pro team member. Says Farmer, "We also thought it was key to have a couple regionally-diverse riders who enjoy spending time in SoCal so we picked Nick Visconti from the Lake Tahoe area and Ryan Paul from Minnesota." Paul and Visconti are considered to be two of the strongest new snowboarders on the scene. Says Visconti, "Mountain High is so much fun to ride. The warm weather, the excellent park, babes everywhere…Who wouldn’t want to ride there? I'm really excited to be part of the team and filming there this winter." Look for an introduction to the new team in a series of print advertisements dropping this fall in Transworld Snowboarding, Snowboarder Magazine, and more. Then get ready for a new video series coming this winter featuring the team and other friends of Mountain High. "The guys are going to be very involved in the resort this season and influencing the progression of the park. We have several solid projects lined up that we'll be announcing soon," added Farmer.